deBebians carries an array of jewelry designs, including Christian jewelry and Christian-inspired jewelry. I have chosen a few pieces that have become popular gift choices for a number of special occasions. deBebians also specializes in creating bespoke jewelry pieces, so if you or a loved one is interested in creating a custom Christian piece of jewelry, please contact us at your convenience. 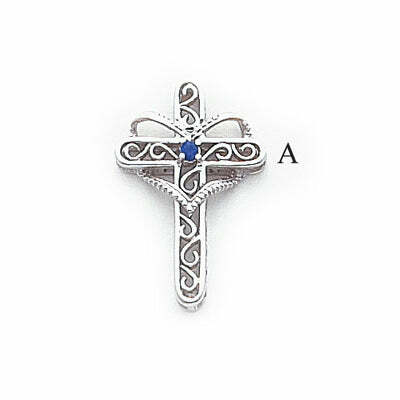 This pendant is shaped like a cross and features one customizable birthstone. It is a wonderful gift for a mother of one child or a new grandmother. We offer this pendant in 14 karat white gold and 14 karat yellow gold. This necklace comes with a matching gold chain with a length of 16 inches or 18 inches. 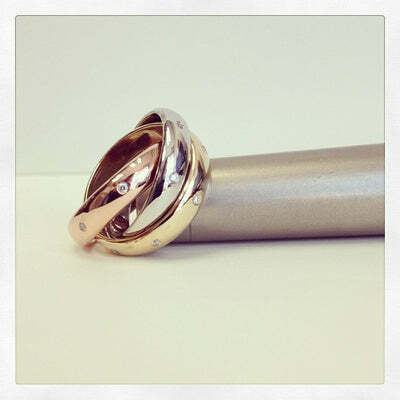 A rolling ring is made up of three rings intertwined to create one ring. The three separate bands represent the Holy Trinity, making this ring a wonderful wedding band to represent your union or as an anniversary ring. Elaine also covered more of our Christian rings in her informative blog post.